With this Dark Knight style Batman vs Superman we're only a few post away from the last of my sketches done for folks out at Heroes Con. (Unless any of you out there still have scans that is). That is very intense...I love the suttle lines yet strong emotional expressions. Just outstanding. If that bad boy didn't go to Tim Townsend, he'll be crying when he sees it! 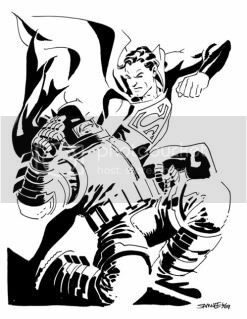 That's pretty darn epic, Mr. Samnee. Superman's expression is priceless (dig those intense eyebrows)! Awesome job and this is the book that helped hook me on comics all over again!
" -- it's way past time you learned -- what it means--to be a man--"